We recently added the latest title, A Gift For Sophie from The Secret Mountain to our storybook and music collection and it is exceptional! A Gift For Sophie is a beautiful poetic storybook highlighted brilliantly by nine family-friendly children’s songs in an accompanying music CD. This story features a seven year old girl named Sophie and her friendship with a boy named Emilio. Their adventures ultimately bring them to Old Man Tom who seeks to show them a new way to view the world around them. Through Old Man Tom’s wisdom and guidance he attempts to teach the two young friends about empowerment, self-confidence and problem solving. 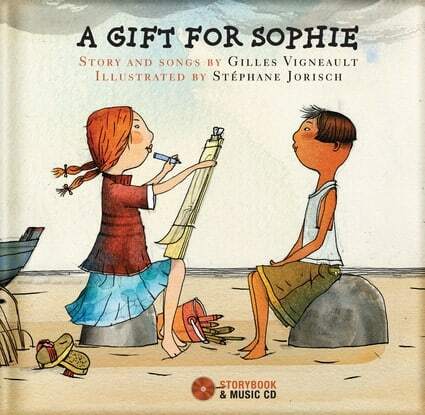 Translated from the award-winning French storybook, A Gift For Sophie is a wonderful coming of age story for young children written by author and Canadian Singer-Songwriter Hall-of-Fame recipient, Gilles Vigneault. My children and I loved the heartwarming storyline. The beautiful, whimsical illustrations by Stephane Jorisch are exceptional and the artwork really brings the story to life. We had a wonderful time together learning the lyrics and singing along to the nine songs featured on the musical CD including our favorites, Nursery Rhyme for the Coming Time, It’s All in the Nature of Things (Old Man Tom’s Song) and I’ve a New Friend (Sophie’s Song). The CD also has the story so children can read along while listening to the story and then sing all of the songs. Featuring performances by Martha Wainwright, Thomas Hellman, Jessica Vigneault and Paul Campagne, A Gift For Sophie is an extraordinary story and music that can be enjoyed together by the entire family. We have several storybook/music CD titles from The Secret Mountain in our home library and this is certainly one of our favorites. In fact, my children have listened to it on the music player in their room several more times and can often be found singing and dancing to the songs. You are invited to visit The Secret Mountain to browse all of the current storybook and music CD titles and purchase your copy of A Gift for Sophie (List Price $16.95 Hardcover book/CD)! Update: A Gift For Sophie is now available as an enhanced e-book for iPad! The Secret Mountain’s Read-Along, Sing-Along digital collection offers a colorfully interactive experience with the stories and music. “A Duck in New York City” is my item of choice! What a wonderful opportunity to read this to my grand-babies! Thanks! She would also like ‘Read-Along, Sing-Along’ E-Book Series! Down at the Sea Hotel looks good. My son would love A Duck in New York City. He loves ducks. Dream Songs Night Songs from Belgium to Brazil seems neat! Dream Songs Night Songs from Belgium to Brazil sounds ideal. Obviously, perfect for bedtime! I like the ‘Read-Along, Sing-Along’ E-Book Series! I think the Title ‘Vivaldi’s World! : An Intro to Classical Music’ is a book my children will love. I would love to have Vivaldi’s World! : An Intro to Classical Music!